Repetitive training and interactive demonstrations and activities help children build typing proficiency. 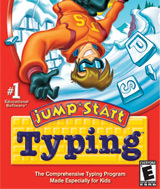 Your child will become an accomplished typist while engaging in four extreme sporting events: rock climbing, skateboarding, foosball, and snowboarding. Diagnostic technology adapts to each child´s skill level, teaching hand placement, posture, key identification, accuracy, speed, and technique.